You can help monitor and conserve Canada’s Important Bird and Biodiversity Areas. Volunteer for stewardship activities and recruit volunteers to clean up natural areas, restore habitat, eradicate invasive species, or protect species at risk in an IBA. Join a naturalist club and support nature conservation and education activities at or about your local IBA. 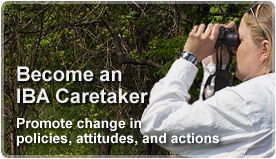 Organize or participate in a bird survey at an IBA. By submitting observations through formal surveys and monitoring programs such as the Breeding Bird Survey, the Christmas Bird Count, eBird Canada, or Breeding Bird Atlases, you can help inform decisions about managing and protecting resources. 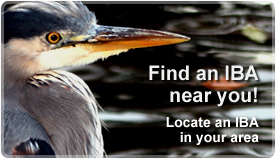 Learn more about bird monitoring programs. Help others connect with nature and learn about IBAs through public talks, nature walks, birding field trips to IBAs, children’s education programs, or by writing articles and letters for newsletters, magazines, newspapers, and other outlets. Advocate for changes in laws and policies that would benefit birds of concern at IBAs, e.g. by participating in municipal planning processes and regulatory processes, or by writing a letter to an elected official. Contact Nature Canada for advice and templates. The Canadian Important Bird and Biodiversity Areas Program is a regional and national partnership. In working together, we will communicate more effectively by using science to rationalize our recommendations, using examples from influential advocacy efforts to better lobby for change. Please keep in mind that if you wish to raise your voice as a Caretaker on behalf of the IBA Program, formal channels should be followed. Please contact us for help. Join the IBA Canada Facebook Community to connect with IBA Caretakers and to collaborate with other volunteers throughout the network.